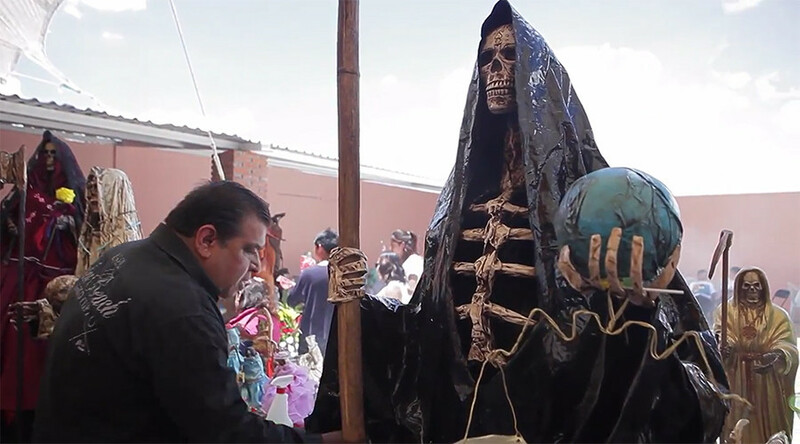 Worshippers flocked to the town of Tepatepec in Hidalgo, Mexico this weekend to pay their respects to Santa Muerte, the patron saint of death. "Many think it's a bad thing, but it's in a church. Many people think it's for bad purposes, but we only ask for good things," one worshiper said. Santa Muerte is popular among poor people across Latin America and the US, attracting close to 12 million followers in the past 15 years, reports the Telegraph. Adherents to the religion call on the skeletal saint to cure them of illness, watch over their family, bring good fortune and prosperity and even help them find love. The origin of the faith is shrouded in mystery, but many believe it is a combination of Catholicism brought by Spanish conquistadors and the native Aztec deity Mictecacihuatl, the queen of the underworld and the afterlife. "When I've needed her most, she's always been there for me. She's helped me out of many bad situations," another attendee said. Santa Muerte has not been canonized nor approved by the Catholic Church. In fact, the president of the Pontifical Council for Culture, Gianfranco Ravasi, previously condemned the Church of Santa Muerte as a “celebration of devastation and of hell,” as cited by Catholic News Agency. "It's not religion just because it's dressed up like religion; it's a blasphemy against religion," he said. However, the ghoulish appearance of the ‘saint’ attracts a darker faithful. The cult-like religion is also popular among Mexico’s drug cartels, which engage in ritualistic killings to appease the figure of Holy Death.